CMS enables users to write, upload and store digital texts such as technical manuals, news articles, marketing brochures etc. The content thus managed entails electronic files, audio & video files, online documents, spreadsheets, image media, word processor documents etc. 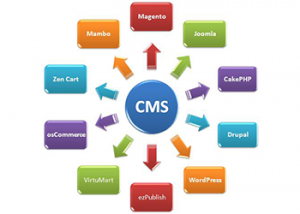 CMS also helps website owners opt for multiple content developers and protect various sections of their website. Enterprise CMS: An enterprise CMS primarily focuses on the management of unstructured information content of a business enterprise. It aims to manage the content and documents related to the organizational processes of a business enterprise. Web CMS: A Web CMS aims to manage and simplify content and documents that are particularly planned and designed for Web publication by the non-technical content developers. Component CMS: A component CMS facilitates building publications from re-usable parts of content within a document. it is concerned with the management of structured content, which produces documents that are to be sent to Enterprise and Web CMS. What elements should CMS have? Easy-to-user interface: The CMS should have an easy-to-use interface so that both technical as well as non-technical users can make most use of the same. An easy-to-use interface of CMS enables non-technical users to manage the front end look of your website. SEO tool kit: The CMS should also entail an extensive SEO tool kit, which will lend the web surfers the ease to find your website on the Internet. Usability of built-in Server Controls: The built-in Server Controls should be easily accessible and usable to software developers and web site designers so that they can come up with a content-rich website instantly and then customize it accordingly with the help of a good API. Other elements required: In addition to the above-mentioned features, the CMS should also be inclusive of other elements such as social networking, Online 2.0 tools, personalization, memberships, subscriptions, geomapping, web alerts, blogging, forums, polls etc. These elements will help you build your online communities by giving you the advantage of repeat business and the visitors will repeatedly land up on your website. All these elements help CMS facilitate development of web pages with professional look and feel without any technical skill. It helps website gain higher search engine rankings. CMS with a web editor will enable users have content of web pages same as the content of HTML documents. Having gathered the basic information about Content Management System, you are good to go now! CMS will make your business a growth-enriching and rewarding experience. All you need to be careful about is that the product that you would be using is supported with all the features needed to address your business needs.